Exchange users intermittently face various issues while trying to mount their mailbox store or public folder store in MS Exchange Server. This often leaves them in a crisis, wherein they are unable to access the data stored on the server. Stellar Phoenix Mailbox Exchange Recovery provides an easy resolution for such problems by quickly fixing corruption in the suspected Exchange database. It helps to get the Exchange Server back up and running by restoring everything without incurring further damage to the database. This problem is encountered when the Exchange database is not cleanly shut down as a result of an unexpected power failure. This indeed gets the database into a 'Dirty Shutdown' state. In other cases, the necessary transaction log files go missing, which are not written to the database. This causes transactional inconsistency in the database and leads to mounting problems as above. To get past this error, you can verify your database consistency by running 'Eseutil /mh' command against the database. If the database is shut down properly, you should move the Checkpoint file and all log files to some other folder and try mounting it again. If the database is in a 'Dirty Shutdown' state, you should try restoring from the most recent backup or perform a database repair using 'Eseutil /p' and 'Isinteg' command-line utilities. 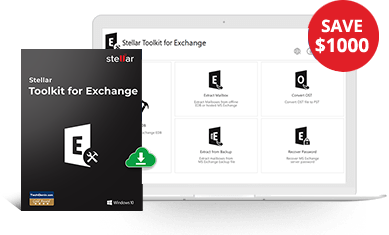 Stellar Repair for Exchange helps you get back all the lost Exchange mailboxes to another live Exchange Server mailboxes, Office 365 mailboxes, or in the form of Outlook PST files. You can easily import the PST file into MS Outlook and regain access to your mission-critical Exchange data.